An Apology: I am so sorry that it’s been a whole month since my last post! As some of you know, I had my mitral valve repaired at UCLA in 2008. I just went through a battery of tests to evaluate heart health which took away from my office time. Everything checked out OK and we’re grateful. Now I can get back on track with writing and managing a very busy life. Rule #1: Everybody including friends and family starts at the bottom level. In part 1, we drew a triangle, divided it into thirds, with the bottom section labeled “acquaintances”, the middle third “friends” and the top section “safe people.” All of your friends and family fit into one of these categories and depending upon your experience with them, they will begin to fit into a classification that will end up defining the nature of your relationship with them. As I said last time, Rule #1 is that all people start at the bottom. Friends, parents, siblings, extended family, business partners, spouses and grown children. Rule #2: People can only move up one category at a time. Nobody is allowed to skip the “friend” category and be thought of as safe without gradually earning their way to the top over a period of two years. We received a call at New Life Radio (www.newlife.com) recently from a woman who complained that her husband was a spiritual dud. He made convincing promises to her that he would be a great spiritual leader. Six months after their marriage, he was a couch potato. I asked her how long they had dated and if anyone had done any pre-marital counseling where hard questions were asked? She said they dated nine months and had no pre-marital counseling. How about you? Have you promoted someone too quickly only to discover that you are hurt over and over by them? Perhaps they need to be demoted to a lower category and less time spent with them? We have several new products in the works that we are very excited about. The first should be available very soon and is a new DVD series titled: Turning Stress in Opportunities for Emotional Connection. 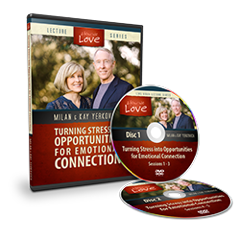 Milan and Kay explore how each Love Style deals with stress and then teach us how to bring our stressful feelings into relationship, thus developing emotional connection and intimacy instead of isolation and loneliness. 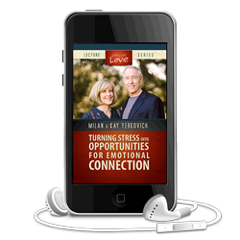 This three-hour audio download is the audio track of a live workshop, Turning Stress into Opportunities for Emotional Connection. In this workshop, Milan and Kay discuss how we can better identify stress responses in ourselves and others and recognize how these moments provide opportunities for emotional connection. Glad your health is well. It was wonderful to see and hear you and Kay in Crystal Lake IL this past weekend. Thank you for leaving sunny and warm California to come speak to the chilly folks of Illinois. 🙂 It was a very informative day. I’m looking forward to hearing more on your new series.